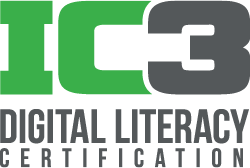 One Certiport IC3 Exam Voucher. You do NOT receive a retake option with this voucher. This voucher is valid at Certiport testing centers only. After placing your order, you will receive a separate e-mail message containing your voucher number. Vouchers are not downloaded.